Since the release of the first iPhone, iPad, and android devices, we have seen an explosion in the number of devices being sold and also in the number of applications released (such as CommandFusion's iViewer 4 ) that allow these devices to be used as the main control interface for control and automation systems. This in turn, has started one of the great debates – can using tablets and smartphones replace expensive proprietary devices and bring home automation to the masses? Or is it just a recipe for disaster? This three part series looks at why consumer based devices are a great replacement for proprietary devices. For the purpose of this document, we will mostly focus on iOS devices as these are currently more commonly used in the automation industry. The first and most obvious advantage is the cost of a smartphone or tablet compared to a proprietary control device. A typical dedicated touch screen could cost well over $2,000, while an iPad which is of similar size and capabilities to common touch panels will cost under $500.00. When Android devices are brought into the mix, the cost becomes even lower and in almost all cases functionality is not only on par, but often better than that of proprietary devices. When dealing with an installation that requires multiple touch devices, this price difference becomes a huge difference in the potential cost of the job. Complementing the cost factor is that these consumer devices are readily available from a number of different sources without the need for special accreditations or being locked into any single distributor. This means that when a device is broken, becomes faulty or needs to be replaced for any reason, it is much cheaper and more easily replaced than its proprietary counterparts. According to Nielsen2, almost half (49.7%) of all US residents now own a smart phone. These consumers will more than likely already be familiar with iOS or Android devices. If they do not already use one of these, they will have seen them advertised and being used by others. This will ultimately mean that they are conditioned to the look and operation of these devices. An iPad will be aesthetically pleasing to most consumers, as well as the operation of these devices will be second nature to them. This also rings true for most Android devices. Most proprietary devices have in built processors; however the speed and power of these processors is severely lacking when compared with an iOS and most Android devices. They also have less memory and only small amounts of storage space for GUI files. This results in special programming being required to work around the limitations of the touch panels, while an iOS device can take almost anything an integrator can throw at it. Long lists can be shown all in one infinite scrolling list, there no need to break the list up into multiple pages. With 8gb+ of storage, large GUI files can be stored on the device and media files can even be stored on the local device and streamed to a television, projector or other display device. On top of being more powerful, tablets and smartphones have additional features that can be taken advantage of in home automation systems. The GPS can be used to implement interesting location based features, and the accelerometer and gyro sensors can also be put to imaginative use to allow for display rotation and other specific actions based on user movement. Multi touch is another feature that is not widely included in proprietary devices – this is an extremely powerful feature that allows us to improve human-device interaction through using a different number of fingers to interact with the display. Add this onto the standard features of most tablets and smart phones, and it makes for a very powerful device. In many circumstances, the customer will already have a wireless network set up in the house for file and internet sharing. 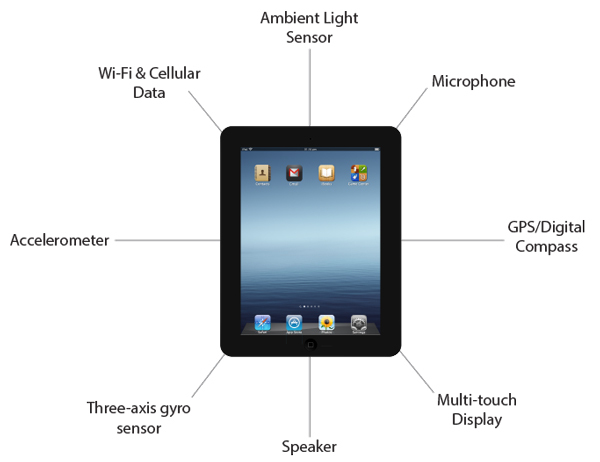 Because devices such as the iPad utilise standard protocols such as Wi-Fi, in most cases this network can be utilized to connect the mobile devices that will control the systems in the premises. This means there is no expensive special cabling required for network connectivity. No additional equipment is required to implement an iPad, iPhone or Android device into the system. There is always the caveat that the Wi-Fi network must be up to designed and configures correctly or it could cause problems. Battery life is a big issue when considering wireless devices. Apple devices actually have quite a good battery installed straight out of the factory. Frustrations of dead batteries will be kept to a minimum and because they use Lithium-ion technology, regular charging cycles are not as important and can be charged via a dock whenever the device isn't in use. In contrast to this, there have been some well know battery debacles from some proprietary devices.